Keynes and Friedman hype from Google Ngram. note: if somebody manages to insert an iframe in a comment thread, I'd be glad to transfer this "diary" to the thread it belongs. 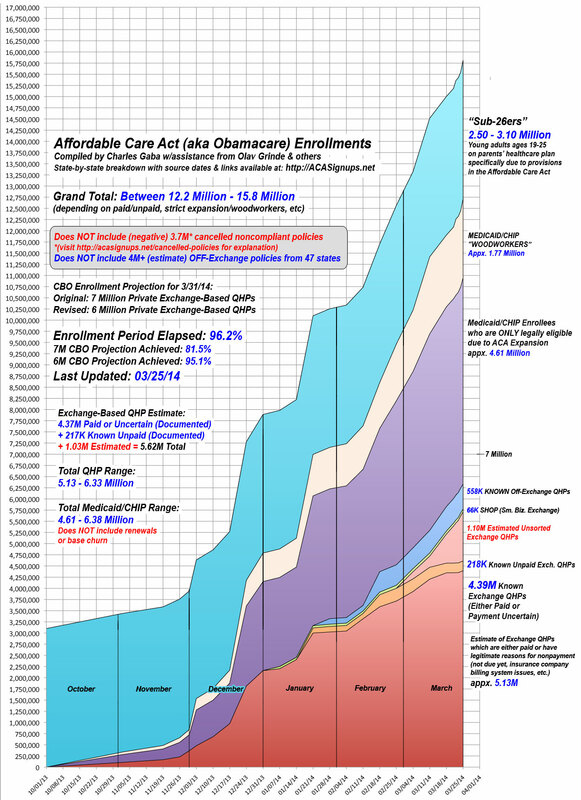 The graph of enrollees gives a good insight of Obamacare success today, which we could compare to a few news items from October/November 2013 (below). It also explains the tone of news a few months ago: the startup was slow and then began to build up power. Will narratives change over time? This morning I made the mistake to turn the radio on while attending to my daughter (milk, nappies, kisses and clothing before bringing her to her gardian for the day) only to find what could only be described as the danger of drug use while attempting to make VSP's predictions. Today's guest was M. Nicolas Baverez, whose talent as a jester is, I believe, quite underrated. We are in 2040. France is on the verge of bankruptcy. The Unesco headquarters left Paris for Berlin. Airbus has even abandoned his siege of Toulouse in favor of Hamburg. After being saved by Europe and Germany in 2025 , the country plunged into bankruptcy. 65% of young people are unemployed , the franc has lost 80 % of its value and the political institutions of the Sixth Republic can do nothing . It is a Beninese, Alassane Bono , the first African to head the IMF , who heads the mission that supposedly will be saving France . This could be the scenario of a hollywodian blockbuster or a fiction film awarded at Cesars. For now, this is the semi- fiction invented by Nicolas Baverez in his latest book , Beninian Letters ( Albin Michel , 2014). ...and, if I may also add, clearly high on LSD at the time of writing. 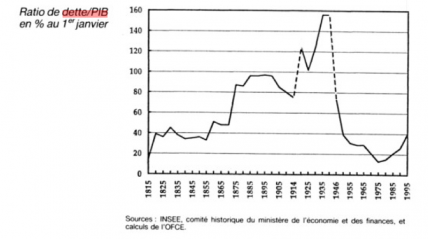 Let's remind our casual readers that France has lived, since 1812, through 1830's and 1848's revolutions, the second Empire, loss of 1870'war against Germany and annexion of two departements, the first and the second world war without ever defaulting on its debt. So tell me: what, in the coming 30 years, could be worse than the 1.6 millions deaths of the first world war, the 550 000 more of the second world war, the loss of Algeria and the arrival of around 1 million wealthless refugees after independance in 1962? Nuclear war? I'm aghast at the idea! A few pics of last Sunday's meeting of the "Front de Gauche" party. This is a very left-wing party (I'm talking American here). It is believed to get something like 10% of votes in the next presidential election. Objective (unsaid): weigh on the Socialist party (whose candidate is the favourite, but whose policies are general center-left, unlike the party's name) to get it to have a pro-left policy. Enough said, and move on to the pictures. A constitutional-cyclo: that guy has written text on a new constitution and advertises for it on his bike. I've been reading the new with astonishment yersterday, after being deprived of that pleasure for a (long) holiday weekend in Bruxelles. So it was new for me to learn that the ECB was lending roughly 500MM at 1% to banks in order to get them lending this amount at 3% to France, Spain or Italy. So I started to write a letter which follow below, and I was wondering, what about if every EU citizen was sending its savings to the ECB and ask for the right to pillage public goods too? I'm writing this letter in English, because, even if french is supposed to be an official language of the Uropean Institutions, it is clear for years that the Union is now of anglosaxon inspiration. I am very conscious, as a citizen of the European Union, of your efforts as ECB chairman to solve the debt crisis in our continent. Your efforts are valued, and I was wondering whether I could give you a hand in the processus. These efforts have lead you to decide last week that the best way to help solve the European crisis was to give the European banks the possibility to borrow from your institution at the very low rate of 1% and lend this money to the troubled states on the continent at a higher rate, provided these banks would deposit some collateral at your institution. I myself have saved some money and I propose to do the same, in order to reinforce your action. I understand that banks may lend 10 times the amount of their assets. I also understand that Member states governmental bonds constitute such assets. I therefore propose to you to deposit my savings at the European Central Bank and lend again the money the ECB would lend me to member states, too. This would allow me to provide some hundreds of thousands euro to member states, and maybe more, as I understand that I may recycle government bonds as collateral to get new fresh money from your institution. This would be a proof you could communicate about that all right minded European citizens have the same access to the European Institutions, without discrimination on nationality or wealth, and that all people could get insanely rich easily without any risks by lending public money to public institutions. This would be a right step in the path of the Lisbon Process, a true proof that liberalization and non rigged competency are embraced by the European Institution your represent, and not, as some populists might say, used to deprive the average citizen of its rights while transferring riches to the wealthy. Anti-Wind debate in France: an ecologist interview. A friend of mine is a researcher in pollution by metals components such the ones you can find in mine wastes. He's just started to write a few texts to explain how you really have to study these phenomenae, the need for complex methods, and some traps to avoid when interpreting data. I think the part on interpreting data is particularly interesting, because we usually have a lot of data in medias on hot issues, you can find information on the exact values, but the meaning of these is almost never challenged. So, if you care to read further, I'll try to extract the best parts, to illustrate how complex it may be to study a physical phenomenon before being able to decide about it.